excipients: microcrystalline cellulose, lactose monohydrate, maize starch, povidone, magnesium stearate, talc purified. Analgesic and antipyretic; ATC code – N02BE01. 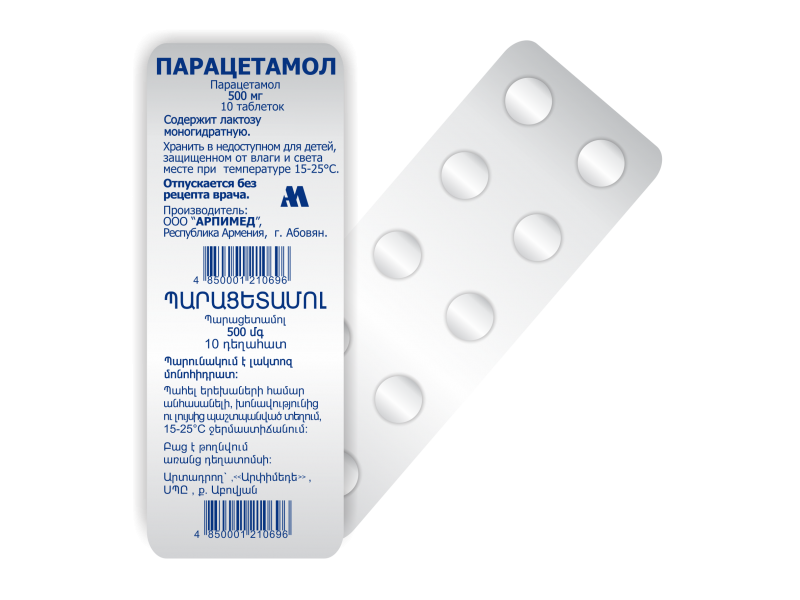 Paracetamol has analgesic, antipyretic and weak inflammatory action. The mechanism of action is associated with inhibition of prostaglandin synthesis and the influence on the thermoregulation center in the hypothalamus. Paracetamol is readily absorbed from the gastrointestinal tract with peak plasma concentrations occurring about 10 to 60 minutes after oral doses. Paracetamol is distributed into most body tissues. It crosses the placenta and is present in breast milk. Plasma-protein binding is negligible at usual therapeutic concentrations but increases with increasing concentrations. The elimination half-life of paracetamol varies from about 1 to 3 hours. Paracetamol is metabolised predominantly in the liver and excreted in the urine mainly as the glucuronide and sulfate conjugates. Less than 5% is excreted as unchanged paracetamol. A minor hydroxylated metabolite (N-acetyl-p-benzoquinoneimine), is usually produced in very small amounts by cytochrome P450 isoenzymes (mainly CYP2E1 and CYP3A4) in the liver and kidney. It is usually detoxified by conjugation with glutathione but may accumulate following paracetamol overdosage and cause tissue damage. The usual adult and children over 12 years single doses by mouth is 0.5 to 1 g (1 – 2 tablets ) every 4 to 6 hours up to a maximum of 4 g daily. 6 to 12 years, 250 to 500 mg (1/2-1 tablets). These doses may be given every 4 to 6 hours when necessary up to a maximum of 4 doses in 24 hours. 1 to 5 years- Dosing regimen established by doctor. The recommended single dose may be repeated if required every 4-6 hours, but not more than 4 times / day. Course duration: for the symptomatic treatment of fever – not more than 3 days, the pain – no more than 5 days. In rare cases, nausea, epigastric pain, allergic skin reactions, changes in the peripheral blood (very rarely – thrombocytopenia, leukopenia, pancytopenia, neutropenia, agranulocytosis), which are to remove the drug. Do not exceed the recommended dose prescribed by doctor. Paracetamol should be given with care to patients with impaired kidney or liver function.Taking paracetamol long-term may develop hepatotoxicity and nephrotoxicity. It should also be given with care to patients with alcohol dependence. Patients with rare hereditary problems of galactose intolerance, Lapp lactose deficiency or glucose-galactose malabsorption should not take this medicine, because 1 tablet of Paracetamol content 25.0 mg lactose monohydrate. During the administration of paracetamol control of the picture of peripheral blood and functional state of liver is necessary. – If the patient suffers from a congenital galactosemia, lactase deficiency, malabsorption of glucose and galactose (product contains lactose). Tell the doctor if the patient suffers from one of the above diseases or take other medications. Need to abolish the use of the drug or to consult a doctor, if within 3-5 days the patient’s condition does not improve or new symptoms appear (it should be borne in mind the possibility of a more serious condition). No adverse effects have been observed in breast-feeding infants whose mothers were receiving paracetamol, and it is therefore usually compatible with breast feeding. The BNF also considers that the amount of paracetamol distributed into breast milk is too small to be harmful to a breast-fed infant. Paracetamol is generally considered to be the analgesic of choice in pregnant patients. Symptoms: nausea, vomiting, anorexia, abdominal pain (may be one of the first indicators of liver damage), abnormal liver function and kidney function, coma. Toxicity is directly proportional to the concentration of paracetamol in blood plasma. Symptoms of poisoning may even occur after several days. Treatment: Gastric lavage with the subsequent appointment of activated charcoal; if necessary, symptomatic therapy. Perhaps hemodialysis. At paracetamol poisoning is applied and its antidote N-acetylcysteine, which is more effective if it is used in the first 8 hours after administration a high dose of paracetamol. The risk of paracetamol toxicity may be increased in patients receiving other potentially hepatotoxic drugs or drugs that induce liver microsomal enzymes. The absorption of paracetamol may be accelerated by drugs such as metoclopramide. Excretion may be affected and plasma concentrations altered when given with probenecid. Colestyramine reduces the absorption of paracetamol if given within 1 hour of paracetamol. 10 tablets are packed into PVC-Aluminum blister packet.